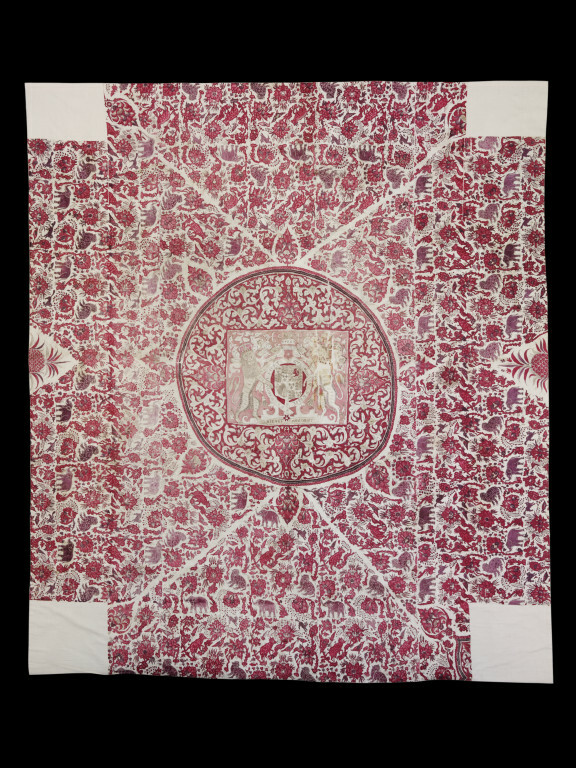 This bed-cover was cut down from a chintz hanging to fit a bed. The central motif is the Royal Stuart arms, suggesting a date during the reign of either Charles I (1625-49) or Charles II (1660-85). The style of drawing is unusual but compatible with either of these dates. The field design of animals, birds and floral patterns is a combination of Chinese and Indian motifs, and the half-pineapples on two sides may allude to the introduction of the pineapple into England in the late 1650s. 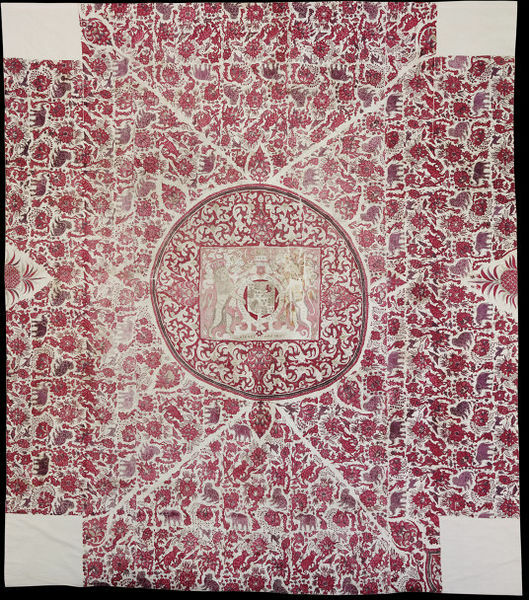 Cover of painted and dyed cotton chintz. 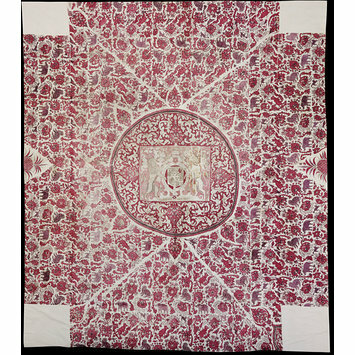 This furnishing piece has as its centrepiece the Stuart Royal Arms of England, as current in the reigns of Charles I and Charles II, in a roundel, on a white field otherwise decorated with fruit, flowers, elephants and other creatures, some are fabulous, in shades of red and purple. Square in shape, but missing square sections at each corner. At intervals, around the gadrooned edge, are eight foliate palmettes. The textile bears the Royal Stuart Coat of arms but it is not possible to determine whether it is contemporary with Charles I or Charles II of Great Britain. The unusual shape of the design suggests use as a table or dias cover. Its exact provenance and early history are unknown. Guy, J., and Swallow, D., (eds). ‘Arts of India: 1550-1900’. London : Victoria and Albert Museum, 1990. ISBN 1851770224 p.162, pl.139. Irwin, John and Katherine Brett, Origins of Chintz, London, 1970. With a catalogue of Indo-European cotton-paintings in the Victoria & Albert Museum, London, and the Royal Ontario Museum, Toronto. ISBN 112900534.